At the time of the interview Flora Spencer-Longhurst was performing as Reza in the new musical Once at the Phoenix Theatre. 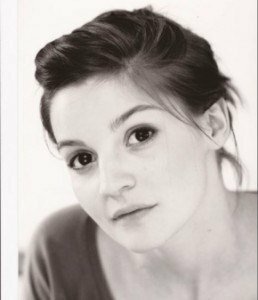 Flora’s roles in theatre include Girl With A Pearl Earring (Theatre Royal, Haymarket) and The Children’s Hour (Royal Exchange Theatre). Her television credits include Father Brown, Leonardo, Unforgiven, Wallander, The Real Deal, Losing It, The Family Man, Lewis and Dalziel and Pascoe, while her films include Walking With the Enemy, Moving On (Short) and Eye Candy (Short). Earlier this week Flora took time out to answer some questions about herself, her career and Once. When did you first discover that you had a desire to act? I always enjoyed being in school plays, but I suppose it was when I joined the National Youth Music Theatre aged 11 that I realised how much fun it was to pretend to be other people and dress up! You made your professional stage debut as Frankie Addams in The Member of the Wedding at the Young Vic. How did it feel to have realised your ambition? I remember so vividly the phone call from my agent telling me they’d offered me this part. I was in a play at University at the time and was about to go on stage, but I had to take the call. I was so overwhelmed and just couldn’t believe it (definitely shed a few tears) and apparently the first thing I said to my agent was “Oh my god, does this mean I’m an actress?? ?” It was incredibly surreal and scary and I felt ridiculously lucky to be in such a cracking play at one of my favourite theatres in London working with Matthew Dunster. With that job, everything was new to me so it was hard work but I learnt so much and loved every minute of it. You performed as Rosalie Wells in The Children’s Hour at The Royal Exchange Manchester. Can you tell us about this? I was actually in my final year at Manchester University at the time and so was writing my dissertation when not rehearsing/performing. It was a hectic few months and a bit of a challenge! I really loved the play though and working with Sarah Frankcom was brilliant. The Royal Exchange is an exciting space and it was a very different experience to the Young Vic. I was very lucky to be part of such a fantastic cast and it was unusual that lots of us were a similar age as the play is set in a school. You performed in the musical adaptation of The Importance of Being Earnest. What was it like performing in this adaptation of this Oscar Wilde classic? A real hoot! It is such a fantastic play but Douglas Livingstone, Zia Moranne and Adam McGuinness managed to take this classic and turn it into a charming, witty and original show whilst very much capturing the essence of the comedy. This was a fun job and I loved playing Cecily. On television, you have performed in several detective series including Dalziel and Pascoe, Lewis, Wallander and Father Brown. How would you compare your experiences? Do you have a favourite? Whilst they are all detective series, they are stylistically different and I played very different characters in all of them so each job had its own challenges. I loved filming them all for different reasons. Dalziel and Pascoe was exciting as it was my first TV job. Lewis was fun and a challenge as I had to learn to mime the trumpet, and also try and commit suicide in a river. Wallander was filmed in Sweden and we stayed on the coast so that was pretty special. Plus it was amazing working with Kenneth Branagh. Father Brown was in the Cotswolds – lovely! It is hard to pick a favourite as I really enjoyed all of them, but if I had to say one, I’d probably go for Wallander as the whole experience was a bit of a dream. You have appeared as Lisa/Tomaso in CBBC’s Leonardo. What have you enjoyed most about being in this popular series? Leonardo was such a fun series to be a part of. I loved being in South Africa, I loved the set, I loved the adventure factor (running round being a big kid), but I think most significant were the people involved. I feel very lucky to have worked so closely with Jonny, AK and Colin and the rest of the brilliant cast, the wonderful directors, production team and crew. It was a top gang and I made some best friends on this job. You have appeared as a victim in some of your roles. Is there a particular television or film genre that appeals to you most to perform in? Well, I’ve always wanted to do a period drama. Also having done a comedy pilot last year, I’d like to have a crack at some comedy as I think it’d be good fun and a big old challenge. You are in the cast of Once as Reza. What can you tell us about your character and how she fits into the storyline? Reza is one of Girl’s Czech housemates and good friend. She is pretty feisty and along with the other Czech characters provides some of the light relief. She’s outwardly very confident and secure in herself and doesn’t care what people think about her, but under her brash exterior, her heart is in the right place. What attracted you to be a part of Once? Everything! The music, the wonderful book by Enda and of course the incredible creative team. I was also attracted by the prospect of playing the violin onstage as I hadn’t played my violin or done much music in a while. How does it feel to be back on stage as part of a musical? A real treat! This is honestly a bit of a dream job. I’m having so much fun doing the show and it is lovely being in the West End in a show I feel really proud of. What sets Once apart from other musical and why should everyone come along to see the show? I would describe it as a play about music rather than a ‘musical’. Aidan who plays Billy in the show referred to it as ‘a play and a gig’ the other day which I think encapsulates it well. Unlike most other musicals around at the moment Once is all about simplicity and intimacy and there is a lot of silence. It is about the power of music and love – two things that everyone can relate to in some form or other. I love eating out, so going out for a good meal with pals and drinking nice wine is up there. In terms of day-time chill out, I swim a lot which also helps with show aches and pains. Going to the cinema and theatre are other favourite pastimes. Those and eating coconut flapjacks at Foyles opposite the theatre. Film Credits include: Walking With the Enemy, Moving On (Short), Eye Candy (Short). Television Credits include: Father Brown, Leonardo, Unforgiven, Wallander, The Real Deal, Losing It, The Family Man, Lewis, Dalziel and Pascoe. Theatre Credits include: The Importance of Being Earnest: The Musical (Theatre Royal Windsor, Riverside Studios), The Beggar’s Opera (Regent’s Park), A Christmas Carol (King’s Head Theatre), Girl With A Pearl Earring (Theatre Royal, Haymarket), Ghosts (Young Vic), The Children’s Hour (Royal Exchange Theatre), The Member of Wedding (Young Vic), Toad of Toad Hall (Birmingham Rep).